The Mueller report is finished. Complete. Turned in for a grade. 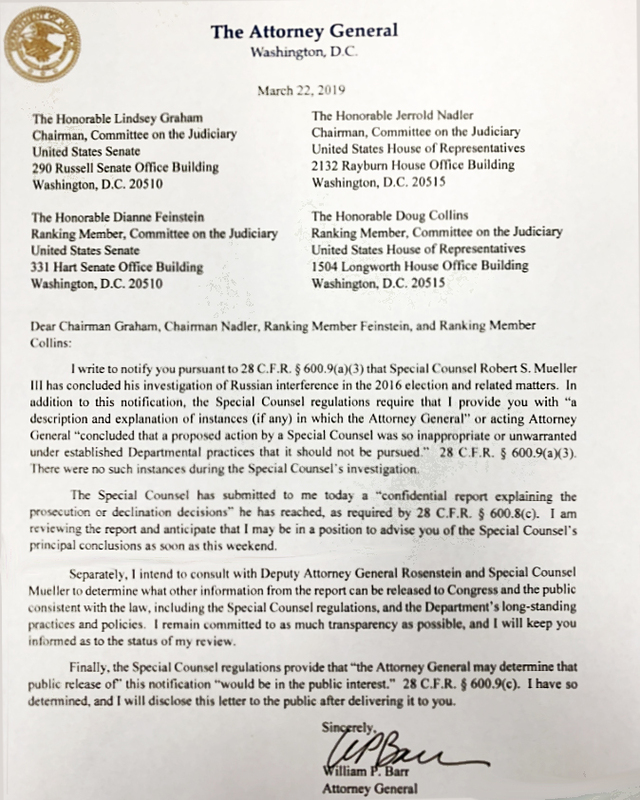 It has been submitted to Attorney General Barr and the President’s attorneys have released a statement. Barr will be offering a summary of the findings to top lawmakers over the next few days. What we know is it didn’t come with recommendations for ANY indictments. Pelosi and Schumer also released a statement. ABC News reports what sources say the President is saying about it. Sources who have spoken to the President tell @ABC News his initial reaction to today’s news is “glad it’s over”. A sentiment for all to share.
.@ABC News’ @MLevineReports : senior DOJ official: Mueller is not recommending any further indictments. UPDATE II: There’s some waffling about whether it’s no recommendations for further indictments or no more indictments, or that maybe there are sealed indictments people don’t know about. I guess this means Trump and his lawyers did a good job with those written questions and answers they gave to Mueller. I remember Trump telling the press that the questions were easy because he did nothing wrong and has nothing to hide. People were afraid or hoping (if they are R or D) that Trump will mess up his answers and invite a charge. No more indictments? Does this mean that the real conspirators are getting off scot-free? We need to have some videos posted on the site of liberal’s crying over the Mueller report. Two and a half years of their lives wasted, their viewers deceived, their hearts broken. Maddog Maddow would be a good place to start. I was at least expecting them to have found that Pres. Trump was colluding with Col. Mustard in the library for that candlestick. I have to catch up. The world still turns while I sleep and it spun really fast this time! kong1967 You sleep? I thought that you were here 24/7! Dr. Strangelove I can’t seem to stay awake this weekend. Was way behind on sleep. kong1967 Same here. I wanted to sleep in, but woke up around 2:30. Nap time. Cue Democrats for further grinding and gnashing of teeth. Anyone think there was “collusion” (being sarcastic here) concerning when this report was released? For such a big story the Friday night news dump seems like a bizarre time to release this, no? Obummer used to do that Friday night news dump his entire time when he was squatting in the WH – 412 Friday’s. CruzGal Yeah, and apparently it’s also a big sports weekend. The timing is more than a little suspicious. Real justice would mean indictment of McCabe, Strzok, Comey, and… HILLARY CLINTON. I saw some clown try to claim recently that since Hillary Clinton didn’t intentionally distribute classified information with her private server, she wasn’t in violation of the law. That same clown would probably want you or me thrown in jail for unknowingly breaking some EPA regulation while working in our yard. Yeah, wake me up when that happens. @ @GHalv In a fair world, yeah. Anyone believe that with the release of Mueller’s report,nearly all of those announced nut jobs will un-announce their Presidential run for 2020. I would love to be the one to present the Koch Brothers a few copies of Mueller’s report and of course be allowed to say a few words when giving those reports. No, sorry. Democrat Congressfolk are not empowered to do criminal investigations. Sessions and Rosenstein will both be able to testify about what they know, because they won’t be officeholders. Trump can now freely declassify whatever he wants without fear of “obstruction!” charges. So Democrats clamoring for full transparency are simply virtue signaling, as they quake in their boots over what is known about this massive scandal finally coming to light. 2019 is shaping up rather nicely. K-Bob It’s way past time that our side got some excellent news. It’s infuriating what the Democrats and their puppets have perpetrated on this country. Time for Trump to ramp up the action and Let’s Finally MAGA! There should be a Trump vindication party/celebration for America to see! Then Hillary should be investigated/prosecuted for Russian collusion! They should light up the White House and/or Trump Tower just to torment everyone on the left. 2020 is Trump’s to lose. Let’s hope he is smart in his tweets, and doesn’t do so many silly Trump things now that he has been vindicated. Hopefully, the pressure is off a bit, and he will have more impulse control. He needs to stop talking about John McCain for one thing. All that’s necessary there is for the McCain family to shut up about Trump. Until and unless they do, Trump will hit back. And I don’t blame him. I would, too. Hopefully the voters focus on Trump’s presidential accomplishments and not his spat with the McCain family. If Trump had manufactured a fake dossier to prevent McCain from occupying the White House, wouldn’t Meghan McCain have a completely different perspective on the matter? Anybody want to place odds on that? The left is in full meltdown mode. Apparently some House Dems are planning on bringing Mueller before a committee to get to the bottom of this. I was never Trump back in 2016 but the left has made me a 2020 Trump voter. I’m not going to put on a MAGA hat or board the Trump Train anytime soon, but I won’t be silent in calling the leftist nutjobs out. Hardest hit… all the NTs. Forget the loons on the Left. The NTs must be put on suicide watch. Where’s @Deep State Annie? Did Trump just win a second term? Shhh, saying the demon’s name can invoke it. Still #NT, figured the Mueller report would be a nothingburger all along. Yeah, sure. Of course… you were expecting Trump to be led out in handcuffs after the shyster’s report. Sorry. Try again. Liar. Find one comment anywhere where I said anything remotely like that. You can’t, so you just make up bull$#!+ like this. Not my crew, asshat. You enjoy lying about people almost as much as Trump does. You just admitted you were still NT… and so are they. You’re telling me that NTs are now divided in two groups? Come on!! As I’ve said repeatedly, everyone who is #NeverTrump is so for a different reason, but that fact is apparently too much to penetrate your skull. I could tell everyone about the time you were caught in a public bathhouse with a goat and a jar of peanut butter and be just as truthful about you as you are about me. So now there are different reasons… there’s one main reason, to get Trump out of the WH. So please, stop acting “smawt” with me. In fact, I proposed nearly a decade ago that Schmidt never be trusted by anyone on the Right ever again after what that clown did to Sarah Palin. But facts don’t matter to cretins like you. I went over to The Dark Site (one article was all that I could take) and I did not see her. BTW, there was some grudging acceptance of Mueller, but Orange Man Bad! Did you take a shower when you hightailed it outta there? @Scope They’re really not that bad over there if you overlook the prevailing hatred of Tromp and the rejection of anyone who doesn’t agree 100%. We have been lied to and forced to use 22million of OUR tax dollars for NOTHING. Nothing there. The reckoning I believe will happen under AG Barr. msliberty Later on Ingraham, Laura said 30million! Whether it’s 22, 30 or 40 it’s still far too much of our own tax dollars to force us to spend on a hoax that was based on hatred and seriously (perhaps irretrievably) damaged this country. Lois Lerner deserves to have her name on that list. Do you think any of those things are really going to happen? If they do, I’ll be very pleasantly surprised, but I’m not holding my breath. C.W. Smith I’m not naïve. I said “I want real prosecutions.” I did not say they would happen, so don’t go twisting my words into some silly semantic argument. But okay then, I can only take you at your word. Scope formerly pinecone “Just move on” is the Establishment way. They’re drastically miscalculating if they think Trump voters are just going to move on, forgive and forget and everything is now cool. It’s not. It allows a dangerous precedent to stand. Barr needs to look at the overall damage and do everything in his power to bring trust back. The Democrats will take any non-action by GOPe as being a green light for them to continue their bad behavior. You know this. I know this. The Democrats know this. If Barr doesn’t act, the only people in America who don’t know this are the effingREPUBLICANS! Unfortunately that train already left the station, long ago. When did the Republicans in DC ever fight one little thing that Obama did? Better yet, when did any Republican in DC ever fight against GWB’s domestic policy that I still believe drove more people out of the Republican party that at any time previously. GWB remained silent throughout the Obama presidency, but low and behold I’ve been reading articles where the GWB presidential center, along with GWB himself have been very vocal against Trump’s immigration policy. Remember GWB had to hyphenate his position as a “compassionate conservative.” As though conservatism isn’t emotional enough, and compassionate enough? GWB is deep state. Barr was a Bushie. Meanwhile, Maddow, Matthews, Cuomo, Stelter, Lemon, Shep Smith and the rest of the leftist jerks are on Suicide Watch. Shepard Smith Under Fire For Sexual Assault Claims, Could Spell Doom For His Future At Fox. MST3K I wonder if that claim is legit? I bet The Murdoch’s will go to bat for Smith. Of course the Murdochs will go to bat for Shep. He’s their favorite gay liberal on the network. Ho hum,another friday night release and cleary hoping this will go away after the Sunday Morning talk shows. I’m not a Trump fan. At first I was embarrassed to defend him, but it was just so unfair, what was happening… I didn’t vote for him, but he won, and then he did a pretty good job. I knew from the first time I heard it that Donald Trump was not a Russian spy, that was flat out ridiculous. The whole special counsel thing was so unfair. So unfair. If any person earned re election for POTUS it’s Trump. I can not imagine the inner strength it has taken to endure this for so long. He must be a very strong person. He’s earned a second term. So goes the Roadrunner (Trump) while the Deep State wails in the dark. Those campaign ads have likely already been written. This would be a good time for multiple Trump rallies…. I like that! Ding Dong the witch hunt is dead….massive celebration! Now that the witch hunt is over let’s get to prosecuting those who caused this hoax. I love that….how are we ever going to stop this character assassination without cause if there is not a penalty for it?? Look at what they have put this country through and now people that will never learn about or believe the truth!! A lie. A total lie. Perpetrated upon the American people by Democrats, Never Trump and the Media. Attempt to overthrow the duly elected President of the United States because they didn’t “like” him. To hell with those who voted for him (including me). To HELL WITH US! The perpetrators of this WITCH HUNT won’t stop until they’ve stripped flyover country of their rights. Please, don’t let them succeed in their ultimate WITCH HUNT GOAL. No doubt Wallace will fit right in with the new Fox model, now being run by a Murdoch son who is a clear global warming believing lefty. Anyone remember how the NTers were going to come gloat about what would come of this investigation? I do. They’re pretty quiet these days. Me too! Absolutely disgraceful what they put him and his family through. Trump has my family’s support in 2020. Trump ought to pardon him tomorrow. I agree with that. The Mueller team bankrupted him, and destroyed his reputation. Where do you go to get your reputation back? The WH would be a good start. Looks like the Democrats will just have to try to win on Jew hating and illegal immigration. They could go back to the 1850’s – secession and don’t take away their black slaves. Ronbo The Democrats do not intend to let this Mueller report be the final word. They will continue this charade odd infinitum, thereby destroying this country further. The Democrats are nothing but anti-American subversives. And many on “my side” played into this awful chapter in our history. I resent each and every single one of them. There is a sort of justice in it all. The left blamed Comey for Hillay’s loss in 2016 and Trump’s win. Now Mueller, brought about by Comey, may have just handed Trump a landslide win in 2020. So…the demorats want transparency? I didn’t notice them wanting transparency to the FISA court when they used the Steele Dossier, which was based on dirt from Fusion, a company hired by Hilliary’s campaign for opposition research. Did anybody think there would be any more indictments? For what? The only indictments were for other things, not for Russian collusion. For many on the Republican side hasn’t John McCain been considered a “foreign policy expert”? He was a part of the entire Russian Conspiracy hoax. Oh, my bad, Can’t say anything bad about the departed/dead. I don’t buy they fell for it. They knew it was a hoax. They fell for the hoax hoping it would do Trump in. I notice they go away when I refresh the page. David Jenson Yeah, I have a lot of problems. Repeats, sometimes my touchscreen doesn’t work on some icons, if I click to reply from my inbox it won’t go to the comment, and a couple other little glitches. Disqus was better… when it worked. This will be an oldie but goodie…………. Auntie Maxine on Morning Joe. Landscaper r I don’t know what I’d do without a weekly, wacky comment from Aunt Maxie. msliberty Yes, I hear Schmuck is waiting for the FINAL, final report.